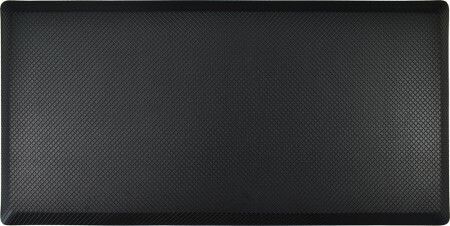 Surpahs’ ultra-comfortable, extra-large, premium anti-fatigue standing mat is the perfect choice for professional or home based use. Designed to ease foot, leg, and lower back fatigue while standing for long periods of time, our 40” x 20” or mat provides more coverage, for flexible movement. The waterproof, non-slip, top, resists slipping in the event of a spill. The rubber base is non-skid and works on all flooring types. The memory foam core is specially designed to balance the need for shock absorption and resilience, providing sturdy support combined with the ultimate comfort. Help eliminate aches and pains after standing for long periods of time. Our highperformance mat eases the stress that causes this discomfort. We’re so sure you’ll love your new Surpahs standing mat, we stand behind it with a 100% Satisfaction Guarantee.